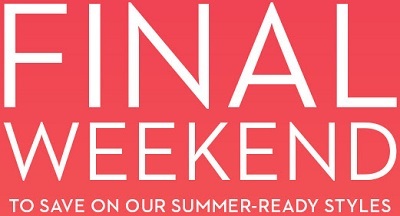 This weekend is the final one to save on Chico's summer-ready styles. Receive an extra 40% discounts on already reduced styles. Plus, get these special offers: jewelry starting at $11.99, Tops starting at $17.99, Pants & Jeans starting at $24.99, Jackets starting at $29.99. Plus, BOGO offer on full-priced styles: buy one get the second one with 50% discount (valid on selected styles). Source of the information is Chico's. Offer expires today (06/05/2016). For more details visit Chico's store location in the U.S or Chico's online.